On Saturday I turned 50. Okay, a parkrun birthday and not actually 50, but still a great milestone. 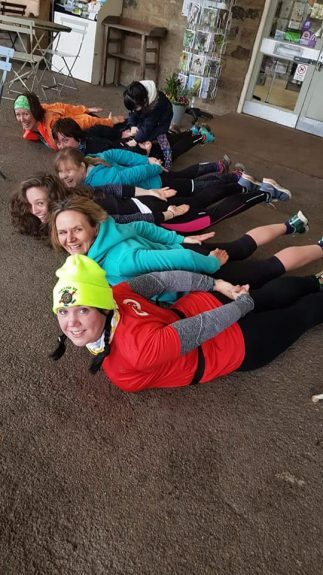 I celebrated with lovely running chums at Bakewell parkrun and it was fab. Not so long ago, parkrun for me was a race, only to be done to smash it and get a PB or close to it. No wonder I found them tough going and didn’t really enjoy them. Somewhere along the line I had a word with myself. Parkrun is about soooo much more. Sometimes I race hard. Others I rock up for a leisurely plod, catch up with friends and just enjoy it. Generally its lovely people, coffee and sometimes ace cake too. This change in attitude and how I approach running is really important. Do what works for you. Running for most of us is what we do for fun. We challenge ourselves. We achieve great things and push our boundaries. What makes it amazing is when we find what works for us as individuals. That’s when the magic happens. Whatever your run distance, whether you run like phoebe or with the gazelle- like style of Mo Farrah, be bold, be brave, be you.